The Legend of the Five Rings RPG: Fourth Edition brings the land and characters of Rokugan to life in a revised and streamlined edition. Originally published in 1997, Legend of the Five Rings RPG Fourth Edition is based on the Legend of the Five Rings Collectable Card Game first published in 1995. This new edition presents improved streamlined rules in a rich, detailed setting that has been made timeline neutral. This allows the setting and rules to be used more like a toolbox, providing a wider range of options for GMs and players alike, as well as the room for a GM to customise the game as he/she sees fit. Legends of the Five Rings RPG takes place in Rokugan, a land inspired primarily by not only by feudal Japan, but also by China and Korea. It is a land dominated by eight Clans that vie for control and influence on the battlefield in Summer and at court during Winter. They are the Crab, Crane, Dragon, Lion, Mantis, Phoenix, Scorpion and Unicorn clans. The clans are comprised of the Samurai and beneath them, the many peasants that they govern. The Samurai are what the players will role-play in the game and there are several different types of Samurai to portray. All Samurai adhere to the tenets of Bushido that will vary according to his clan. The strong setting and rich background of Clans, their interaction and political manoeuvring offer a sound foundation for role-players to explore and build upon. Legend of the Five Rings RPG: Fourth Edition Core Rules is the starting point for the Legends of the Five Rings RPG. This book contains everything that a GM and players will need to play, including the background and history of Rokugan; the rules of the Roll-and-Keep™ system and character creation; plus foes, allies, and a starting scenario. In addition, both the GM and the players will need some ten-sided dice. It is recommended that both the GM and the players have ten dice each. Like all of the books for Legend of the Five Rings RPG: Fourth Edition, the Core Rules are beautiful. The artwork alternately captures the serene nature of Rokugan and its people, and the bloody fierceness of the conflicts fought across the lands of the Emerald Empire and beyond. Legend of the Five Rings RPG uses the Roll-and-Keep™ system that uses ten-sided dice. To undertake an action a character rolls a number of dice, usually equal to a governing trait plus a skill, and then keeps a number equal to the trait. This is expressed as “x – k – y” where x is the number to roll and y is the number to keep. The total is compared to a Target Number (TN), which if equalled or exceeded means that the action is successful. In addition, a character could declare a “Raise” and increase the TN making the action more difficult, but gaining an extra benefit if the roll is successful. Aside from the unique and elegant Roll and Keep™ dice system, the gameplay for the Legend of the Five Rings RPG is rooted deeply in the traditional role-playing experience. As a role-playing game, Legend of the Five Rings RPG Fourth Edition provides a unique and compelling journey for all those that wish to embark on quests and experiences in feudal Japan. It is a game that is rooted deeply on tradition, culture and etiquette, where the characters are expected to be courteous and to place honor and duty to the Emperor, their Clan, and their family above other more self-centered concerns Discourtesy and ill manners will lead a samurai to be shamed at best, disgraced or even challenged to a duel at worst. Since all the clans struggle to gain the favor of the Emperor, there is a unique caste system and interaction that only this setting can provide its PCs. Combat in this age is quick and deadly. Therefore creating a need and requirement that players expand their view and role-play with a deeper and broader perspective than simply the next dungeon, or monster of magic item. Note: If you have never played a RPG before, this might not be the place to start. The recommendations below assume that the gamer types have played some type of RPG. The rich depths of the setting and the game’s themes of honor and duty are likely to be too demanding for the average family game night, although teens may enjoy the rich setting. Even though the rules are simple, the game’s setting can be more intricate than a Social Gamer might like, although Rokugan does have a strong social element. As with most RPGs, it’s not really a party game. The intricate nature of the inter-Clan relationships and the labyrinthine plots that play out across Rokugan can be very strategically and politically motivated. Strategy Gamers who enjoy role-playing games should try it. RPGs take a certain amount of commitment. Although the rules are easy to learn, casual gamers may not commit to the length and breadth of the campaign. Unless Feudal Japan is your “thing,” tread carefully. The Avid Gamer who enjoys RPGs will enjoy immersing himself in the rich, detailed setting of Rokugan. The rich and rewarding experience is a must for any Avid RPGer. The L5R RPG is an easy to learn, but politically empowered role-playing experience. Honor and fealty are is a dangerous as the katana wielding samurai. The Power Gamer will take the game to the level that best meets their needs for enjoyment. This is a Power Gamer’s RPG. Legend of the Five Rings RPG: Fourth Edition is very much a “Culture” game, one that rewards the GM and his players immersing themselves in a setting that is unlike the Western medieval fantasy of other RPGs. It is not the Medieval Japan of Hollywood films, but there are moments when the heroics of such films will have a place on battlefields of Rokugan. Unlike such films, this is not a setting that favors the individual, a samurai being expected to put the Emperor and his clan before himself. This will make it a very different playing experience, but one that rewards attention to detail and good roleplaying. It helps that this latest edition of the RPG makes both the rules and the setting very accessible, helping to bring Rokugan to life. Enemies of the Empire focuses on the threats faced by Rokugan, not just from the demonic hordes from the Shadowlands beyond the Wall that the Crab Clan mans, but also hidden conspiracies within Rokugani society, the Clanless Ronin, and the races that once occupied the lands of the Emerald Empire. Emerald Empire details the culture, practices, and day-to-day life of the Rokugani people in detail, covering commerce, law politics, war, and more. The Great Clans examines the eight Great Clans of Rokugan in detail, focusing on the various families, histories, and culture as well as their place in the Emerald Empire. The Imperial Histories explores ten great periods in the history of the Emerald Empire in detail, providing era specific rules for each one, from the Dawn of the Empire to the Clan Wars and beyond. The Book of Air explores the many different aspects of Air in the setting of Rokugan, from the mellifluous words of the courtier and the speed of the duellist’s blade to the singing arrow of the archer and the gusts of wind at the command of the devout shugenja. This world created by AEG continues to inspire and entertain. If you enjoy deep inter-character experiences and immersive role-playing environs, dive in to the Legend of the Five Rings RPG. The Emerald Empire of Rokugan demands much of its samurai: service to one’s lord, service to one’s Clan, and service to one’s Emperor. Bushido’s staunch and unyielding code of conduct binds samurai to duty, strengthening their character and defining their choices. While some samurai serve the greater good, others use the strictures of Bushido to manipulate the lower ranks and advance their own power. Will you follow honor or reject it? The choice is yours! Eight Great Clans form the heart of Rokugan’s culture. Each is defined by its own principles, values, and agendas. Each sees the Code of Bushido in its own way. Each seeks to serve the Emperor with its own unique talents. Take up the soul of your ancestors — the samurai’s daisho — and fight for the glory and honor of your family and Clan. Now is the time for heroes, in a world where Honor is a force more powerful than Steel. The Role-Playing Game is currently in its Fourth Edition and uses uses the Roll-and-Keep™ system. 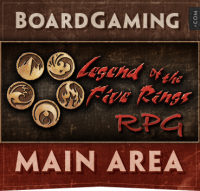 Add a Review for "Legend of the Five Rings RPG: Fourth Edition"